Many times you could read from our posts about the advantages and benefits that you can get for promoting Zetaniche offers in low competitive geos. Many times we have enumerated countries where Zetaniche operates and even few times you could have read brief interesting facts about certain countries. This time we wish to devote a complete post to one real beauty, very well known to many of you in different aspects, a part of Balkan soul – Serbia! Serbia is a country placed in Southern Europe and taking part of Balkan Peninsula. Although this is a country with very long and interesting history, we will focus on the present but in sense of internet world develop in this wonderful country. Serbia counts 7,040,272 of population. The capital of Serbia is Belgrade. The official language is Serbian, native to the 88% of the population. There are also other recognized minority languages such as: Bosnia, Croatian, Hungarian, Albanian, Slovak, Bulgarian, Romanian and Rusyn. As online world through the years got on the significance and took over the young generations by making them available everything on the internet, through reading news, articles, making friends, finding love, buy anything they wish, even having classes online at the same time made a bit of confusion for some older generations that are used to old school way of working and functioning. It was and it still is difficult for many people to change the way they were working before and switch to way that includes new technologies and to keep in track with these fast develops and changes that online world is constantly bringing. And Serbia is definitely one of the countries that was facing these problems. Although, the usage of internet is keep growing with each year, there is an inevitable fact, that there is still part of population in this country that never used internet. There is 68.1% of Serbian household that possess computer which makes increase of 2,3% compared to 2016, and 3,7% increase compared to 2015. When it comes to internet usage, on March, 2017, statistic showed that there is 4,758,861 internet users in Serbia which makes around 68.0% of Serbian population, presenting an increase of 3.3% in relation to 2016, and 4.2% increase in relation to 2015. The greatest proportion of the Internet connection is in Belgrade and it reaches to 77.5%. It amounts to 68.7% in Vojvodina and 63.8% in Central Serbia according to Statistical office of Republic of Serbia. Over 3 120 000 persons use a computer every day. When divided into age groups, internet usage will look like this: 99% of 16-24 years old use internet on a daily basis, 95% makes 25-34 years old and 87% are those from 35-44 years old. 45-54 years old take penetration rate of 75% and those ones over 55 years old makes 81% of daily logging. 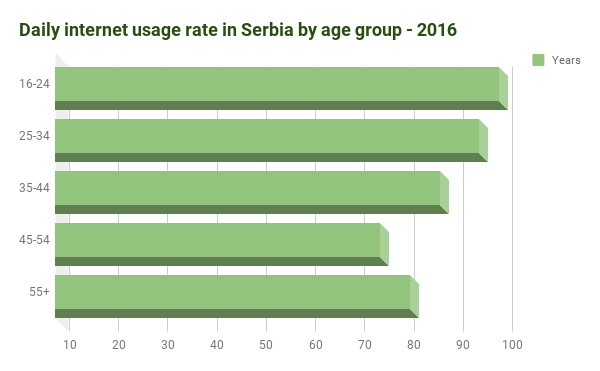 An interesting fact is that almost ¼ of Serbian population have never used computer nor internet according to the research made by Statistical Office of the Republic of Serbia, which makes around 25% of total Serbian population. 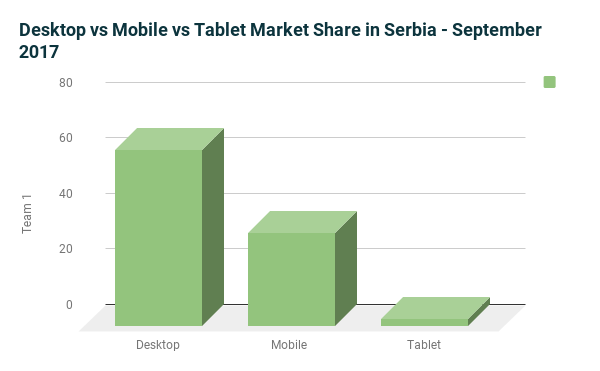 Desktop vs Mobile vs Tablet Market Share in Serbia for September 2017 is: Desktop (63.72%), Mobile (33.67%), Tablet (2.61%). 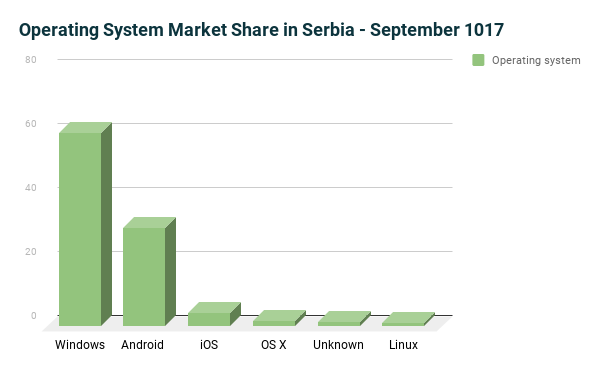 Operating System Market Share in Serbia for September 2017 is: Windows (60.59%), Android (30.73%), iOS (4.09%), OS X (1.6%), Unknown (1.24%), Linux (1.21%), Series 40 (0.2%), Nokia (0.11%),Samsung (0.08%), SymbianOS (0.03%), BlackBerry OS (0.04%), Chrome OS (0.04%), %), LG (0.01%), PlayStation (0.02%), Other (0.01%). There is 3.58 million active Serbians on social media where Facebook makes leading social network, and when it comes to split over Social Media, follow the data below. 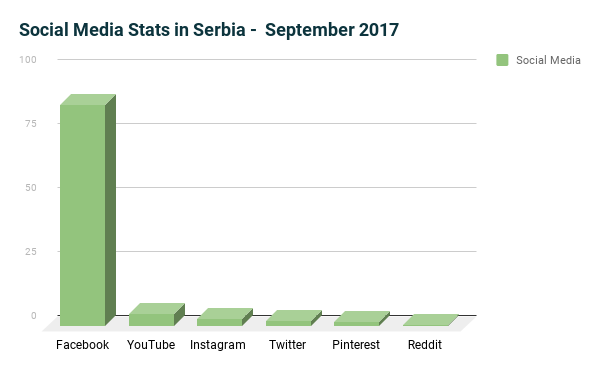 Social Media Stats in Serbia for September 2017 are: Facebook (86.41%), YouTube (4.93%), Instagram (3.05%), Twitter (2.29%), Pinterest (1.89%), Reddit (0.56%), StumbleUpon (0.15%), LinkedIn (0.06%), VKontakte (0.09%), Google+ (0.1%), Other (0.01%). Now when we have seen all these numbers and percentages that gave us a clearer picture of internet status in Serbia, let’s see how Serbians are acting when it comes to making purchases via internet. It is inevitable fact that the way of communication has significantly changed over the past years. With this said, exchange of information are being much faster and many different data are now fully available to people from all over the world. All of this, of course had a lot of impact on different areas of humans life but also business wise. Popularization of the internet made a huge shift compared to years that preceded millennium. At this point, we will focus on marketing part that any company, that wanted to keep in track with the trends and increase sales of their products, needed to adjust. This trend hasn’t left out Serbia as well, even though she was behind the world till recently. This is supported by the fact that marketing spend has raised over recent years since advertisers are investing more and more in digital advertising. 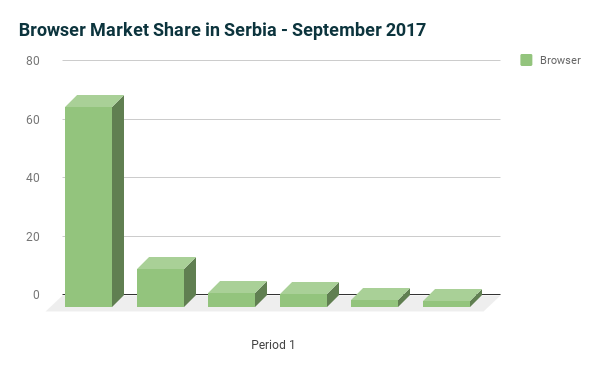 Despite the fact that people in Serbia are still very skeptic when it comes to online buying, there is continuous growth of more than 10% per year. The main reason for this trend are positive experience of young people that are practicing more and more buying on the internet, but also the expansion of number of sites who are dealing with sales. We all know that there is no better commercial from a high reference of satisfied buyers, that will break even those most skeptical and make them want to try to buy something online. Let’s face it, sitting at your home with you laptop on a rainy day, searching something special while surfing on the internet and hey, you found it. And wow, you don’t even have to leave your house to make the purchase and yet it will be delivered to your home address, the idea doesn’t sound bad at all. Even those ones that categorically refuse to make a purchase online, at one point they will do it. It is just imposed by the future. Anyhow, when it comes to Serbia, the satisfied buyer is definitely the driver that will make the influence on them to try this service. One big plus will also make the service of free shipping that will make an influence on making decision for online purchase when it comes to Serbians. As for the numbers for online buying, more than 1,63 million people in Serbia was buying or ordering goods or services via internet in last year but at the same time almost 49,9% has never bought or ordered anything over the internet. 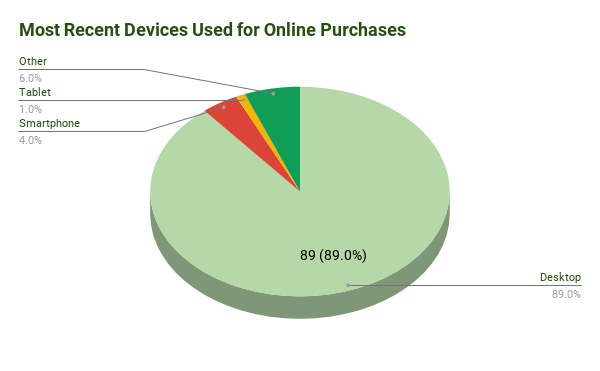 Also an interesting information is that 89% of Serbian online shoppers shop via desktop, 4% will make the purchase via their smartphone and only 1% will make this action via tablet. Number of online orders in Serbia exceeded 2 million in 2016. According to research it has been found that users in average make 13 transactions online for one year. It is expected for this trend to be continued in future especially since all users put all the attention on the payment safety. Almost half of online buyers in Serbia prefers payments in cash after receiving ordered product, which makes our COD offers the perfect choice for Serbian market. For a reminder, check out some of our offers and which of them are available for Serbian market in one of our previous posts. As for other half of online shoppers, prepaid card are most preferred payment choice followed by credit cards and mobile payments. Well dear affiliates, we believe that Serbia makes a great choice and huge potential for any affiliate to start make earnings and to be involved in growth of this market. We hope that you have collected enough of information and recognized the advantages of promoting Zetaniche offers on this yet not exploited but still country you should definitely start your affiliate adventure with. As always, if you have any doubts, questions or simply need suggestions which Zetaniche offers you should start off with, we will gladly assist you and listen all your needs in order to start your Zetaniche journey. So don’t wait longer and join Zetaniche crew and start promoting some of our greatest offers!